WHY ARE PRESCRIPTION DRUGS COMPOUNDED? WHAT ARE SOME MATERIALS USED TO COMPOUND? MORTAR & PESTLE: A GLASS MORTAR & PESTLE WOULD BE USED TO MIX LIQUIDS, SUSPENSIONS, SUBSTANCES THAT MAY STAIN CONTAINERS. A PORCELAIN MORTAR & PESTLE IS USED TO BLEND POWDERS. GRADUATED CYLINDER: USED ACCURATELY TO MEASURE A VOLUME LIQUID PRODUCT, THE VOLUME IS READ BY THE LOWEST PORTION OF THE MENISCUS OF THE LIQUID AT EYE LEVEL. GRADUATED CONICAL: ALSO FOR MEASURING VOLUME LIQUIDS BUT NOT THE MOST ACCURATE. HAS A WIDE OPENING TO STIR MIXING LIQUIDS WITH A STIRRING ROD. WHAT TYPE OF WEIGHTING SCALE IS ACCURATE TO WEIGHT MEDICATIONS? CLASS A BALANCE SCALE: MOST ACCURATE TO WEIGHT MEDICATIONS. WEIGHTS SUBSTANCES 120MG TO 120G. 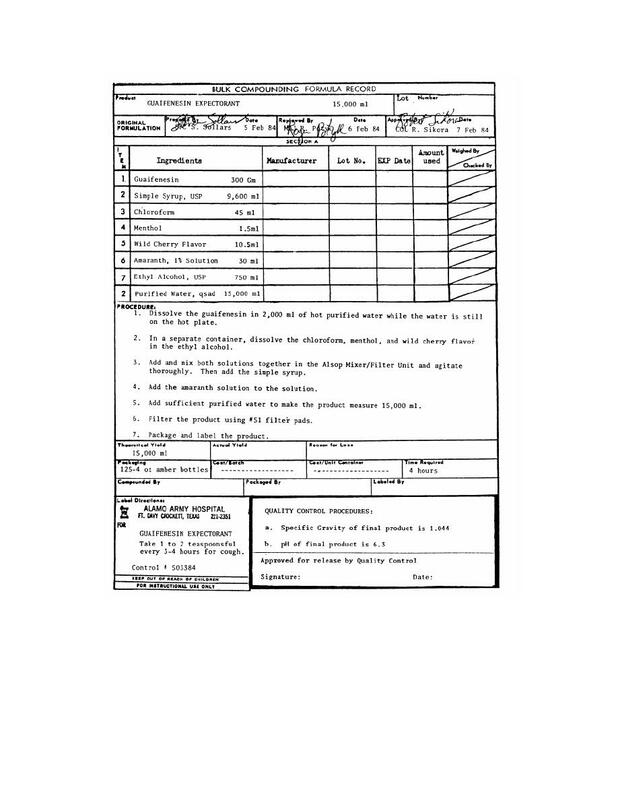 IS THERE A SPECIAL SHEET TO RECORD INFORMATION ABOUT THE COMPOUNDED PRODUCT? YES IT'S CALL THE MASTER FORMULA SHEET. BEFORE STARTING THE COMPOUNDING PROCESS YOU NEED TO WRITE ALL INFORMATION YOU NEED TO MAKE THE MEDICATION AND ABOUT THE MEDICATION. WHAT ARE SOME COMMON INGREDIENTS TO USE FOR COMPOUNDING? SODIUM CHLORIDE: ALSO KNOWN AS SALT. REDUCE TYPES OF BACTERIA LIKE SALIVA. THE INHALATION NaCL (SODIUM) PRODUCES SPECTRUM (MUSCOUS, PHLEGM) FROM THE MOUTH IN ORDER TO COLLECT MEDICAL TESTING. DESICCATION: IS THE PROCESS OF USING DEHYDRATION TO REMOVE MOISTURE FROM A SOLID SUBSTANCE. TRITURATION: IS THE PROCESS IN GRINDING TABLETS INTO A FINE POWDER IN A PORCELAIN MORTAR. LEVIGATION: IS THE PROCESS OF PRODUCING A SMOOTH DISPERATION OF A DRUG WITH A SPATULA. You are to prepare five 60 g jars of ointment using the following formula. How much of each ingredient will you need to create the total amount?